2019/02/12 Look forward to a lot of social activity and meeting people this year, Gemini! Your charm, good taste, and love of fun draws people to you in February. There may be many happy dates and outings in cool, air-conditioned movie theaters, museums, and galleries.If this is an overwhelming exposure to culture, prospective dates will still find you, perhaps through relatives or at family gatherings. Expect lots of invitations in February, with Jupiter retrograde in Leo this year. You dont have to say yes to everything. 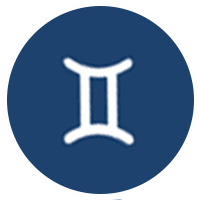 February 15 looks especially promising, though, with the Sun conjunct Venus and the Moon separating from a conjunction with Jupiter.The February 13 Solar Eclipse might lead you to form a harsh opinion about an admirer. Give yourself a few days, stay cautious but open-minded, and see if your first impression holds true. It just might - or not.